Image Size: 31.5" x 19.5"
Those who have chronicled the history of the air war in Western Europe have paid less attention to the history of the Ninth USAAF than is warranted by events. The unsung heroes of the air after the Normandy invasion, the first week in June, 1944, are the pilots of the fighter-bombers of the Ninth... facing down the formidable, defensive firepower of the German anti-aircraft batteries at minimum altitude, point-blank range. During the eleven-month period between Normandy and V-E Day, the 405th Fighter Group lost 125 aircraft, the equivalent of an entire fighter group (100% loss! ), mostly to the murderous Flak that filled the air. The attrition rate on pilots was extremely high, for most contact with anti-aircraft artillery was made at an altitude insufficient for parachute escape. Breakout from the Normandy beachheads was dependent upon interdiction of German armored divisions and supplies by airpower, attacking well defended German logistical supply-lines on roads, in towns and, particularly in rail marshalling yards throughout France. It is reasonable to assert that the Allied success in moving off the beachheads and their rapid advance across France, and into Germany was due to the spectacular results of the Ninth Air Force’s close air-support operations. 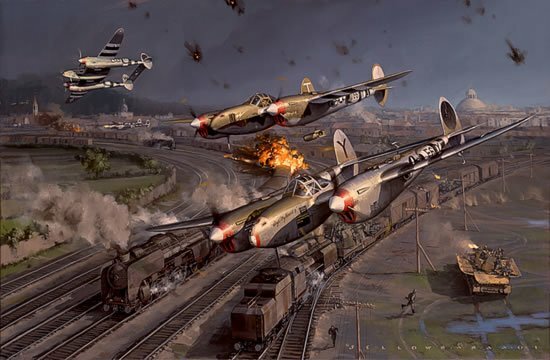 In the painting, elements of the 402nd Fighter Squadron, 370th Fighter Group attack German supply trains in a French rail yard in July, 1944. The P-38 nearest the viewer is "Peg O' My Heart II", flown by Captain Cy B. Coenen, who named his P-38 after a popular song title of the period. Immediately behind Coenen is Major James E. Tucker, Commanding Officer of the 402nd Sqdn. Maj. Tucker was killed in action on August 10, 1944, when he was brought down by defensive ground fire while attacking a train. Coenen, luckily, survived the war.